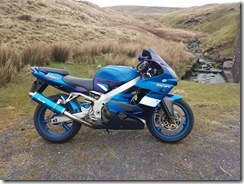 I went out yesterday on the ZX-9R for a quick run around the Yorkshire Dales. 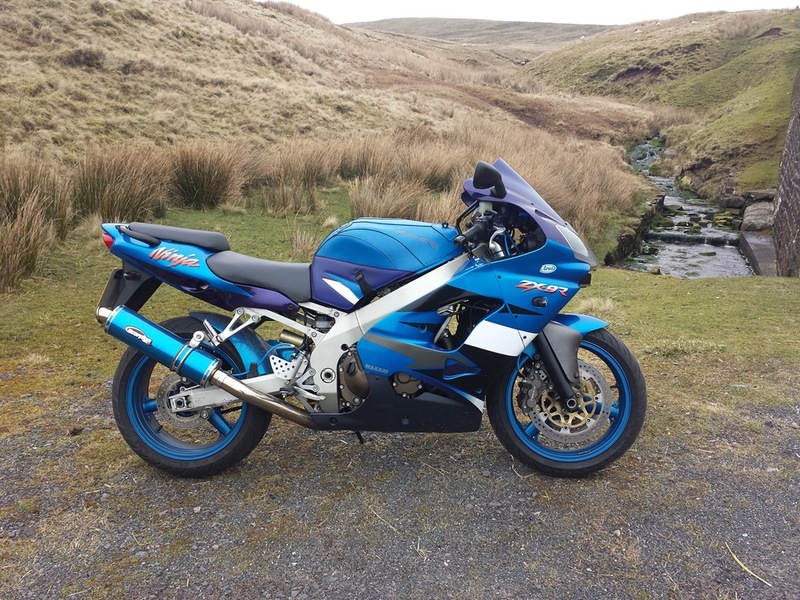 It had to be the ZX-9R as the K1300s is currently SORN awaiting a MOT. Usual pre winter ride checks, oil chain and pump up tyres etc. The back brake was dragging a lot due to the pads having not moved on the disc in months. I rode slowly around the estate and activated the back brake to clean it up and promptly locked it up and had a minor rear wheel slide. Anyway that seemed to do the trick and it was fine after that. I filled up with fuel and then joined the motorway and did a few more controlled braking cycles to clean things up. All seemed well with brakes and bike so I was happy to continue my ride. I headed over to Hawes on the usual roads, M66/A56 towards Clitheroe. Then minor roads to Settle via Sawley and Wigglesworth. Then the usual B6479 to Ribblehead Viaduct and then the B6255 to Hawes. It was quite overcast and cold and the road in places was still a bit damp and greasy. The road surface in generally was in good condition and seems to have survived all the rain, plenty of waterlogged fields though. On arriving in Hawes I stopped at the Penny Garth Café for a much need coffee. It was quite busy for 10:00am in the morning in March. After the coffee I left Hawes on the A684 and headed over to Sedbergh. This stretch of road was particularly damp and greasy in places. At one stage as I applied power to pass another biker the rear stepped out slightly as it lost traction. Thankfully the ZX-9R isn’t too brutal and it is easy to regain control in such situations. I arrived in Sedbergh in no time and then joined the A683 and headed south towards Kirkby Lonsdale and Devil’s Bridge. A vast amount of speed camera signs have been erected along this stretch of road over the winter. Presumably this means that they are now using a safety camera van along this stretch of road at times. Anyway I didn’t stop at Devil’s Bridge as it hadn’t been that long since I was at Hawes. It looked fairly busy but not stupidly so. I then turned onto the A65 and headed towards Skipton and turned off at our usual spot to go passed Stocks Reservoir and through Gisburn Forest. Then joined the B6478 and headed for Clitheroe via Slaidburn and Waddington Fell, where I stopped briefly to take a photo. I then stopped in Clitheroe briefly to refuel before heading home, arriving home in time for lunch. The ZX-9R performed reasonably fine today although there seems to be a flat spot between 5000 to 6000rpms. Above 7000rpms it really pulls fine, will need to have a look when I do the 16000 mile valve check.